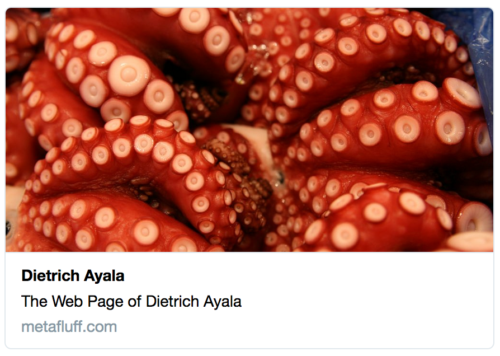 Have you ever noticed that in Twitter, Facebook, Google and Pinterest some links are displayed quite fancily, with preview images, descriptive text summaries and other information? These links are fancy because of metadata in the source code of the web page itself, implemented specifically for the rich display of links inside each of these companies’ content platforms. 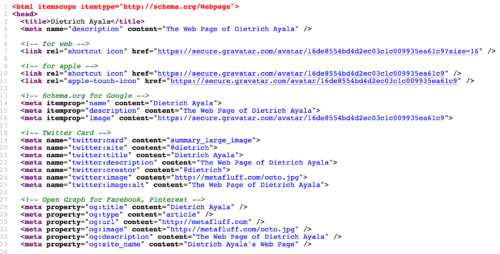 Unfortunately for developers, each of these internet industry titans has implemented their own metadata formats for this: Twitter has Cards, Facebook and Pinterest use Open Graph metadata and Google uses Schema.org markup. The first reason is that fancy links increase click-through rates, increasing engagement and driving traffic to your website. This is good for your blog, your business, or whatever reason you’re sharing the link in the first place. The second reason is that high click-through rates in walled gardens mean people are escaping those walled gardens, spending time on the Wild Wild Web. So, to make it easier to do this, I created Silo Buster. Silo Buster is an easy-to-use website where you enter a small amount of information, and all that <header> goop is generated for you. You can then copy and paste it into your web pages or integrate it into your template or content management system. 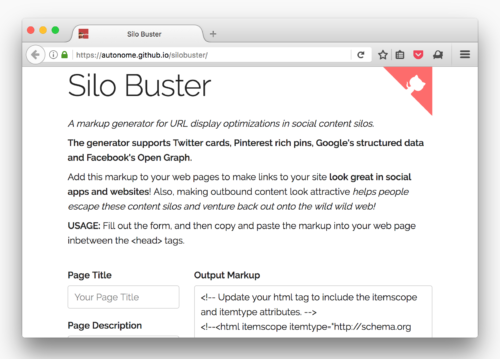 Take Silo Buster for a spin, and then check your analytics and see if there’s any change. Experiment with it: Tweak the photos, or the summary text and check again. If you’d like to learn more about how these sites implement their metadata, and how to debug your rich links, check out the links at the bottom of Silo Buster. If you’ve got other tips and tricks for fancy links, or experiences either good or bad with them, share your thoughts in the comments! Dietrich Ayala is a developer advocate at Mozilla, the non-profit makers of the Firefox web browser, where he's been working for internet freedom and shipping open source software to hundreds of millions of people for over a decade. Hey Gabriel! Your markup probably didn’t make it through the sanitizer. Can you link to a Gist or something like that? This seems like a great use case for a service worker utility library; it would intercept web page responses and then generate and insert the social media metadata into the HTML source before passing it to the browser. OHHHHH that’s a fantastic idea, will have to make a code example for it… thanks Šime! Sime, the data that Twitter and others use to decide how to render the links is read and consumed server side. So a Service Worker would not be able to help here as Twitter would still see the HTML result.